I was getting a bit fed up painting portraits with a black background. I had managed dark brown in the Shrimp Girl but this time I’ve managed blue! This is from a painting by Peter Paul Rubens. It’s been called “Le Chapeau de Paille” though the hat isn’t straw at all. Rubens girl is shy, indeed rather timid. My lassie is altogether more knowing, and older, so I may have another go at her, time permitting. 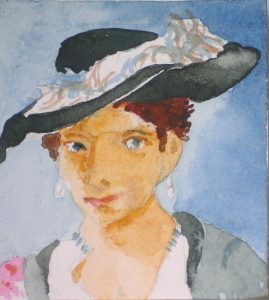 I like the tilt of the hat, the touch of pink and the blue background but the modelling on face (almost non-existent in the original painting) is heavy. I don’t know why it appears to be blotchy in the photo, but it seems smoother in actuality. Maybe if I wash out the face and try again, I’ll do better. However, the next copy portrait I am going to attempt is Van Gogh’s Old Peasant – a truly cheery picture, and I’m keen to see what happens. I can see, I think, what you mean about the modelling of the face, but she’s very recognisable, and the blue sky behind does make a lovely change from all that black and brown!